My youngest son loves tomato soup. He would eat it every day if we would let him. I hate him eating the store-bought variety because of all the extra ingredients and sodium that they put into it. I prefer to make my family homemade tomato soup. In a large pot, melt 1 tablespoon of butter and fry up 1 tablespoon of chopped onion and 1 teaspoon of garlic. Saute until done. Now stir in 2 tablespoons of flour, 2 cups of chicken broth, 3 1/2 cups of chopped tomatoes, 1 cup of milk, 1 1/2 teaspoons of sugar, 1/4 teaspoon of salt, 1/4 teaspoon of pepper and finally, 1 tablespoon of basil. Stir well and let simmer about 15 minutes. Remove from the stove and puree. It is now ready to eat. To me, tomato soup is good comfort food, another good comfort food is my Homemade Chicken and Dumplings. What else do you consider "comfort food"? 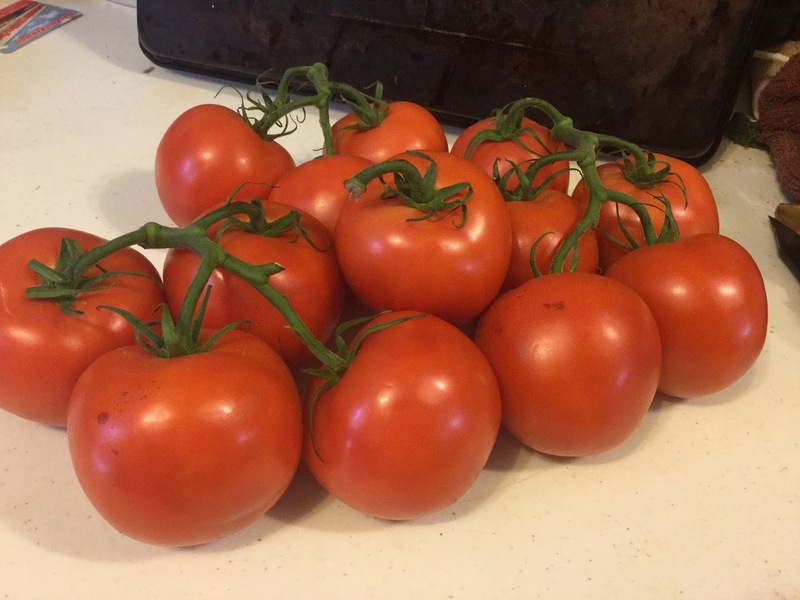 We have an abundance of tomatoes from our garden each year. We eat a lot of them and use the rest in a variety of ways by canning the tomatoes; making tomato sauce; tomato soup; making and canning salsa; and by making spaghetti sauce. Pour all ingredients into a crockpot and stir well. Cook over low heat for 8 hours. I like cooking it in the crockpot because it does not heat up your kitchen and allows the flavors to really "meld" together. 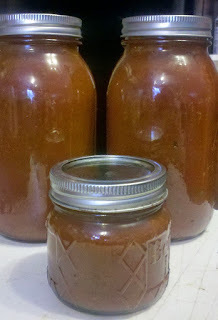 When the sauce is done, pour the hot sauce into hot prepared jars. Add into EACH jar 2 tablespoons of lemon juice and 2 Tablespoons of vinegar into each jar. Fill up to 1/4" headspace and wipe the rims clean with a rag dipped into vinegar. Put the lids on and place into a water bath canner. Water should completely cover the lids. The water should be about an inch over the top of the jars. When the water begins to boil, start timing then. Let boil for 40 minutes. Let me start off with and say that I don't drink flavored coffee AT ALL. I just don't like the taste of it. I want just plain, strong coffee BUT my hubby loves them. We do not buy them because they cost WAY too much and are an indulgence we just can't afford. I remember my daughter buying a frappuccino or something like that a few years back that she bought in a bottle from a convenience store. I tried it and naturally I didn't like it but my hubby sure did. The taste is stuck in my head and I decided to play around with flavors and came up with this drink. 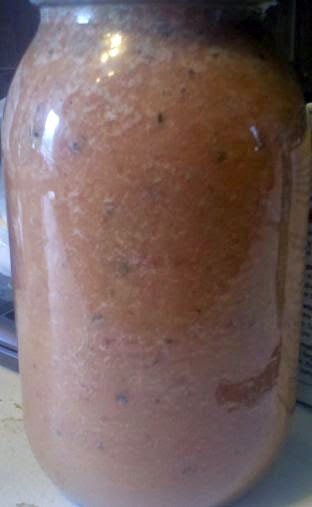 I don't know what it would be considered but several people have tasted my concoction and LOVE it. They say it is equally superb hot or ice cold. 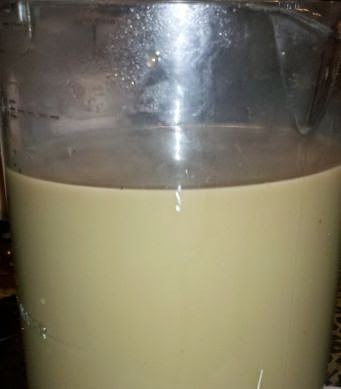 Put the two kinds of sugar into a pitcher. Pour the hot coffee in on top of the sugars and stir until the sugars dissolve; then pour in the creamer. Stir and enjoy. This tastes just as good hot as it does cold. Even my teenage son liked it. 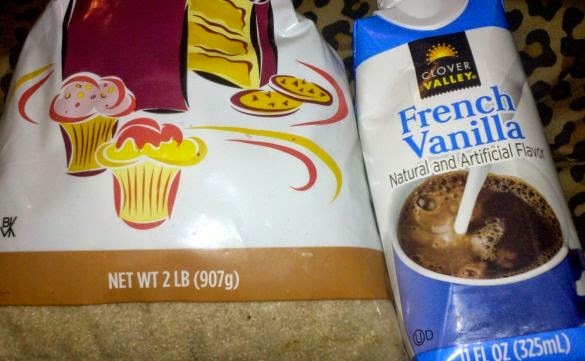 This coffee goes great with my Cinnamon Roll Cake or some Homemade Doughnuts! Okay, I confess. 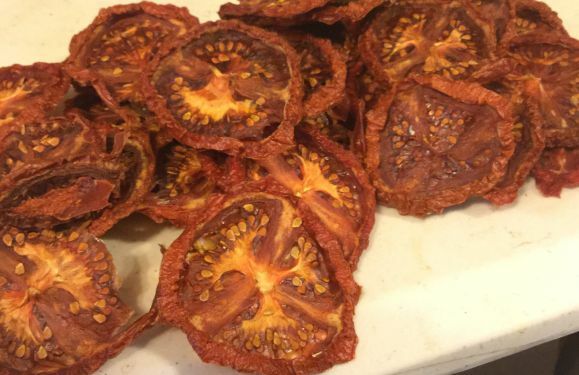 They really aren't "sun-dried" tomatoes but they taste JUST like them. 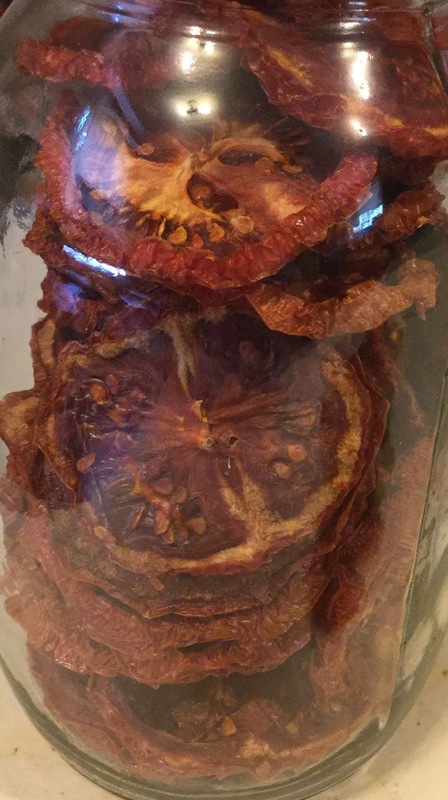 I use my dehydrator instead and they turn out super yummy. AND they cost a lot less than buying them at the supermarket. Wow, they are expensive to buy (about $7 a pound). All you have to do is use fresh-from-the-garden tomatoes (or buy some tomatoes) and then using a sharp knife cut the tomato into tomato slices. At this point you can put the pieces on the dehydrator and leave them plain or sprinkle them with salt, pepper, basil and any other spice you desire. You can cut the ends of of the tomatoes and slice the tomato into wedges. Scoop out the seeds and lay the wedges on the dehydrator tray and season as you desire and dehydrate them this way. Both ways work equally well it is just a matter of preference of how you like your sun dried tomatoes to be shaped. Sliced pieces of tomatoes and tomato wedges. 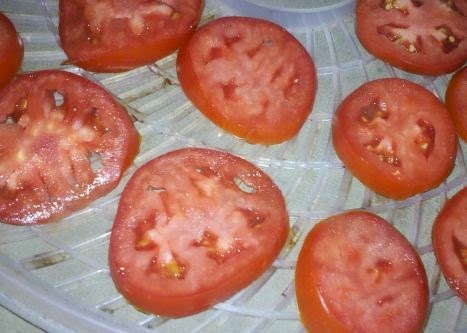 Dehydrate about 5-8 hours, depending upon the thickness of the tomatoes. They should be feel about like a raisin. They should be leathery and not sticky. 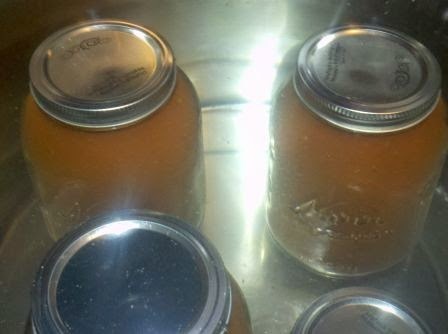 Once they are dry, store in a sealed mason jar. 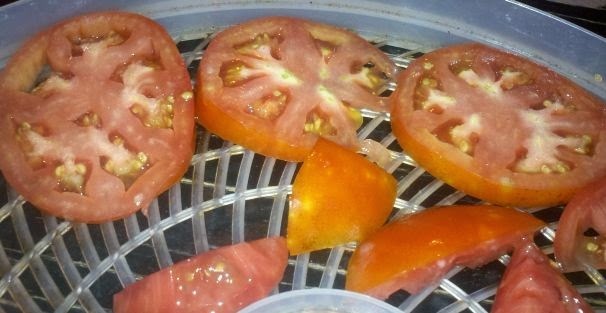 We love doing this to have as a snack and to have nice, yummy tomatoes in the winter time. You can also grind the tomatoes to make tomato powder. I love preparing things ahead of time. I have MS (Multiple Sclerosis) and diabetes so I do not always feel up to cooking and sometimes I am just not able to cook. I prepare lots of freezer meals and one other thing we like to freeze are biscuits to have on hand whenever we want/need them. Mix all the ingredients together. 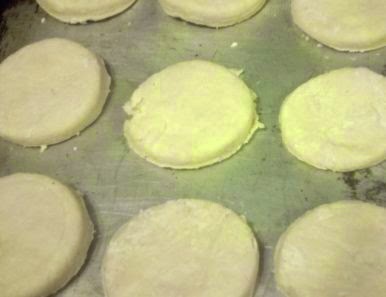 Roll out on a floured surface and cut out the dough with a biscuit cutter, top of a lid, etc. 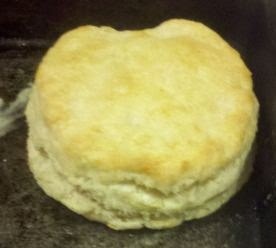 Lay out the biscuits on a cookie sheet and place in the freezer for one hour. 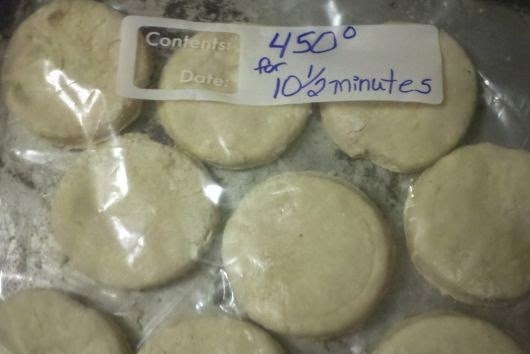 After one hour, you can place the biscuits in a large baggie and place them in the freezer until needed. You freeze them on the cookie sheet to prevent them from sticking together. When you want to eat them, let them defrost for about 30 minutes on a cookie sheet then bake them for 10 1/2 minutes in a preheated 450 degree oven. They rise really good and taste great. The picture below is a biscuit that had been in the freezer about a month. Some other biscuit recipes you might like include: my Potato Biscuits and my Chocolate Chip Drop Biscuit! Preheat oven to 350 degrees. Mix all ingredients together in a large bowl. Form mixture into small balls and place on an ungreased cookie sheet. Now take a fork, dip it in some sugar and make crisscross marks on each ball and gently flatten. You do not need to flatten them much, they will spread out nicely on their own. Now bake for exactly 9 minutes. Let cool for 2 minutes then remove to a plate. These are especially good if you eat them right away. 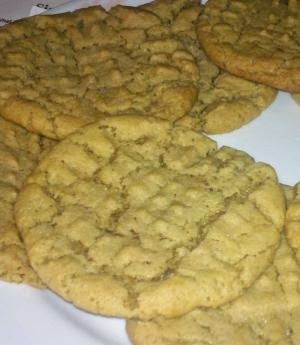 Makes 3 1/2 dozen cookies (about 2 1/2-3" in size). Check out my recipes for Mexican Wedding Cookies and my Homemade Reeses Candy. We had a really good blackberry harvest this year. 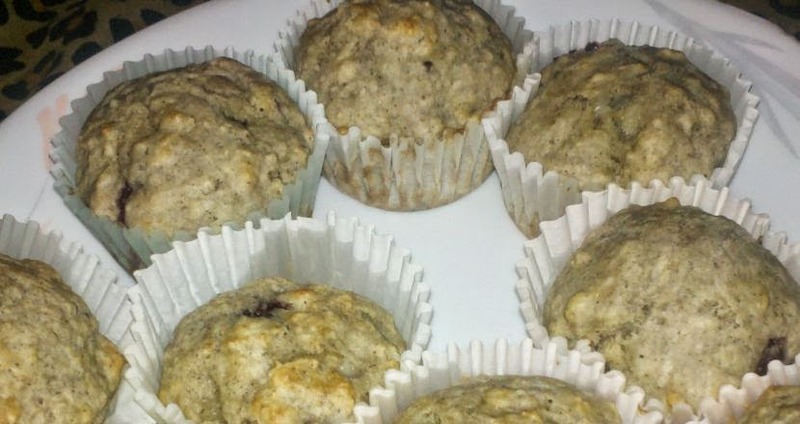 We got gallons and gallons of yummy blackberries and I have been making all sorts of wonderful things with them, including these Blackberry Muffins. Preheat oven to 400 degrees. Fill muffin tins with paper liners or grease the pan. In a bowl, mix together all ingredients (except for the blackberries). When mixed well, fold in the blackberries. Spoon the mixture into the muffin tins and fill them about 2/3 of the way full. Bake for 13 minutes. Makes 18 muffins. I generally double the recipe and make 36 so there is plenty for snacks and a few breakfasts. They freeze well too. No bake cookies are a classic cookie. 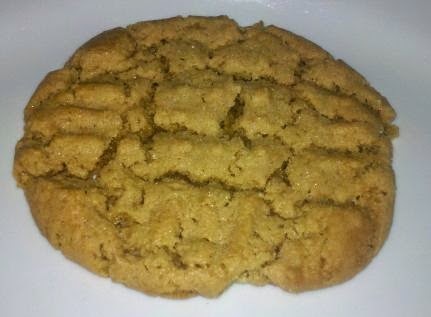 The kind of cookie that grandmas make with their grandchildren. When you ask people to name their top 10 favorite cookies, No bake cookies are generally on the list (along with sugar cookies, chocolate chip cookies, snickerdoodles, peanut butter, etc.) They are just one of the "classics". In a small pot, bring to a boil: 2 cups of sugar, 4 Tablespoons of cocoa, 1 stick of butter, 1/2 cup of peanut butter and 1/2 cup of milk. Let it boil one minute and remove from heat. 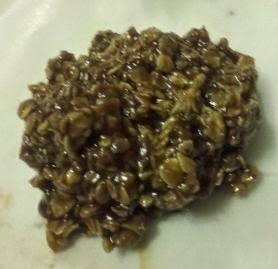 In a large bowl, put in 1 Tablespoon of vanilla and 3 1/2 cups of oats. Pour the hot mixture on top and stir well. Drop by spoonsfuls onto waxed paper. Let cool and enjoy. As many of you know, (those of you who follow us on Facebook), I asked for people to send birthday cards if they would to help surprise Ronny for his 10th birthday. 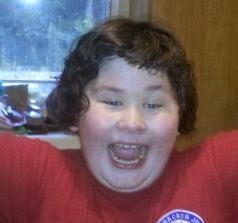 Ronny is autistic and I wanted to do something special for him. The response was overwhelming. 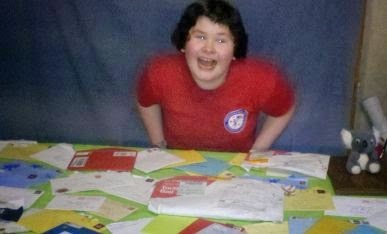 He received over 60 cards, along with gifts. I kept them hidden from him until the surprise party we threw for him. He walked in the door and this was his initial reaction to seeing all the cards and packages. Ronny got cards from all over the U.S. (Kentucky, Louisiana, Georgia, Arizona, Nebraska, New York, Indiana, North Carolina, Tennessee, New Jersey, Colorado, Wyoming, Washington,West Virginia, Ohio, Virginia, Florida, Texas, Oklahoma, Illinois, Connecticut, Pennsylvania, Massachusetts, Maryland, Wisconsin, Maine, Alabama, and Vermont, )along with cards and gifts from Australia, Tasmania, England, and Canada. He got musical cards (Superman theme, Happy Birthday, a dancing Sponge-bob, and Chicken dance card), cards that move (cows kicking and pirates baring their "booties"), regular cards, hand made cards; cards signed by entire families, little kids and farm animals. Kids drew him pictures and he loved looking at them all. 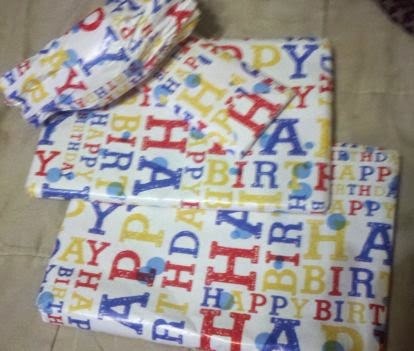 People sent gifts and he even got some money. One family sent a $10 bill; another family sent him $1 and another $2. Very kind of you all and very generous. In many of the envelopes were also stickers (Spongebob, Transformers, Angry Birds, & Pokemon), as well as some "tattoos" too. One family even sent some flavored honey sticks from their farm. He tried the root beer flavored honey stick and kept going "mmm" "mmm". :-) And finally, he also got some glow in the dark dinosaurs. From Tasmania, he got a big envelope full of maps, brochures, a weather gauge, postcards, and all sorts of really interesting things. We have spent at least an hour reading through it all and found it fascinating. He got a stuffed koala bear from Australia that he loves. He has always carried around a stuffed "Pikachu" toy. He takes it everywhere and tonight he has Pikachu in one hand and the koala bear in the other. It is adorable. 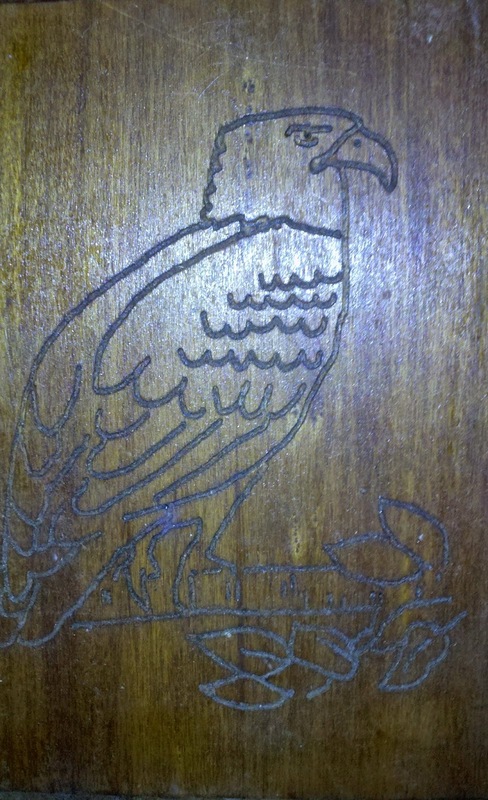 One man made Ronny a wall plaque of an Eagle. It is beautiful and will be hung proudly in our home. Another lady sent Ronny several little gifts and he was over the "moon" for them. She sent him a "minion" plastic toy that makes noise, a couple of notebooks, and some pencils. Everyone was so tickled at Ronny when he opened the small package of #2 pencils. 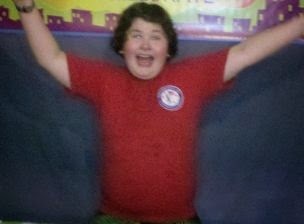 He was super excited. They thought it was funny that he was THAT happy over pencils but that is just how Ronny is. He loves to draw. If we failed to mention something, I am so sorry. Let me know and I will give credit. It was definitely unintentional. Our hearts are overflowing with love for you all! 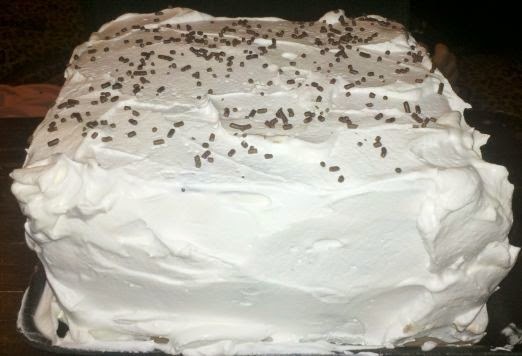 The homemade ice cream cake I made for Ronny. Hello. My name is Melody. I like to dehydrate. (Imitating an admission at a support group.) It's true. It's almost a compulsion. If it can be dehydrated, you better believe that I will try to dehydrate. I'm up to the challenge. If you have been reading my posts you know that I even dehydrate watermelon, eggs, & milk. If it is a fruit, a vegetable, an herb, or any kind of liquid (sauce, etc.) I WILL dehydrate it. To dehydrate lettuce, rinse the lettuce and pat it dry. I then shredded the lettuce. 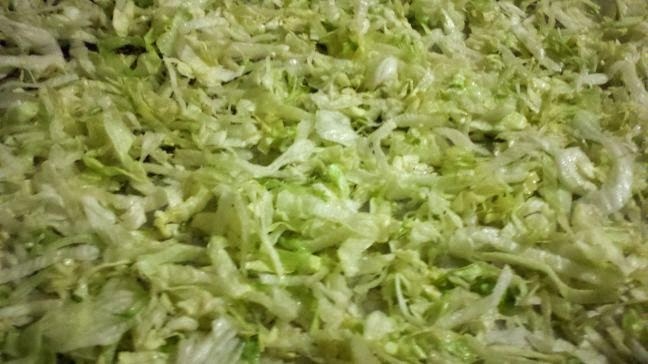 You can also make lettuce chips (similar to Kale chips) if you have leaf lettuce. 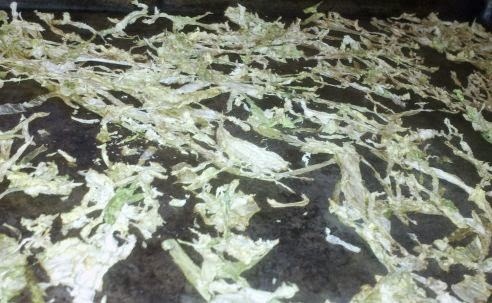 Anyway, once it is shredded, just spread it out onto your dehydrator trays. It does not take long to dehydrate. Within about 4 hours the lettuce should be nice and crisp. I then take the lettuce out and place it in my Magic Bullet and pulse it down into a powder. You can use any greens this way. I do Kale, spinach, carrot tops, collard greens, etc. this way and make "green powder". 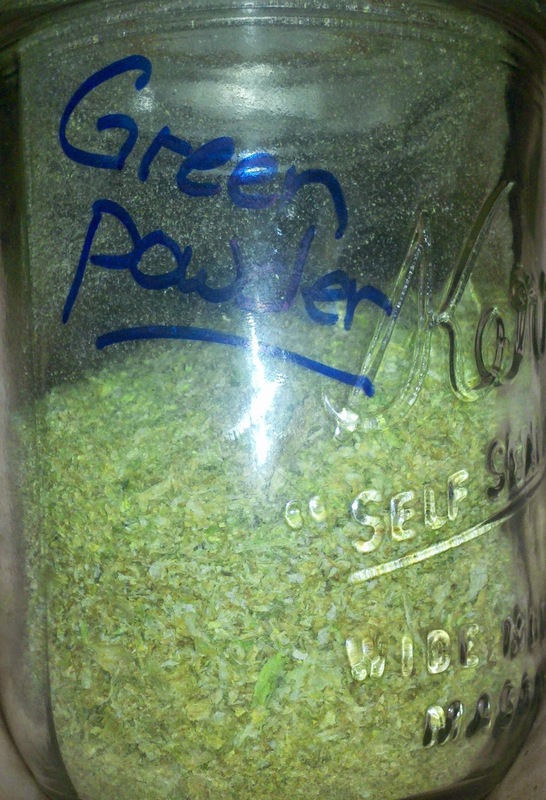 Green powder can be added a teaspoonful or so at a time to eggs, salads, casseroles, meatloaf, smoothies, etc. It adds extra nutrition, with no change in texture to items. A good way to sneak in some veggies without your family catching on. Also, a good way to use up lettuce that may have gone to waste before. I like okra but only if it is coated and fried. That is how I have always been until I tried dehydrating it. 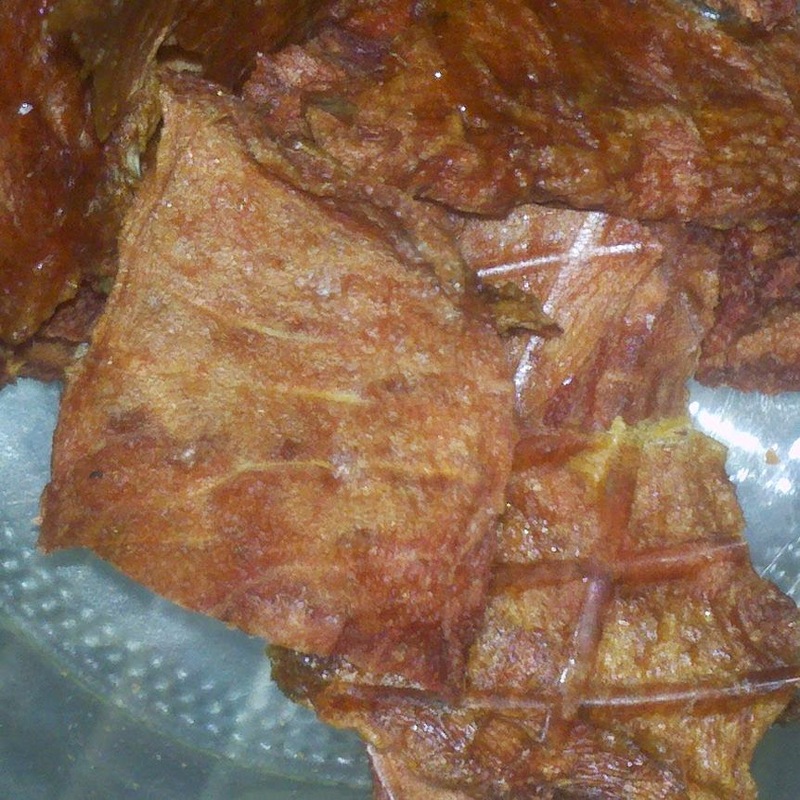 Once it is dehydrated it does not have that sliminess and tastes really good. I dehydrate our okra in 2 ways. Both are great. The first way we cut off the ends and discard them (actually we feed them to the ducks and chickens). Then slice the okra and put them on the dehydrator trays. Let them dehydrate overnight or for 8-10 hours. Remove and store in a glass mason type jar. These can be thrown into a soup, stew or into gumbo. The other way like to dehydrate okra is to make an okra snack. Just rinse your okra well and dip each pod into a bowl of vinegar. 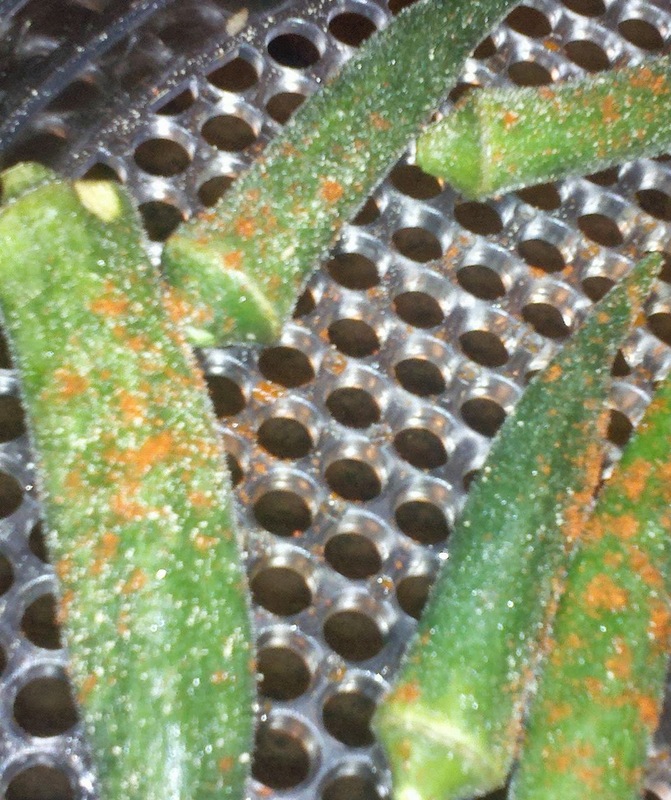 Shake off the excess and place the whole pieces of okra onto the dehydrator tray. Now take some paprika and sprinkle it over the pods generously. Let them dehydrate about 15 hours (or overnight). 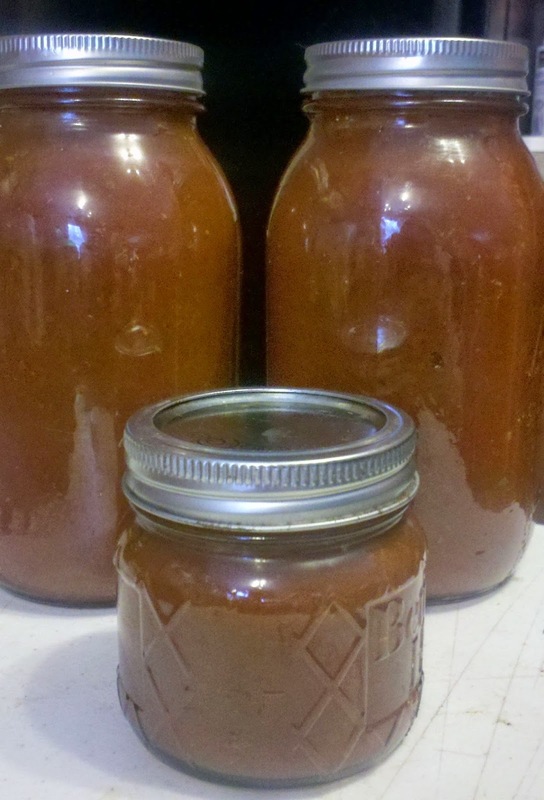 Remove and store in a mason type jar. These are a great standalone snack. Very crunchy and delicious. Dehydrating the okra really concentrates the flavors well. To begin with, rinse off your radishes under cool water. 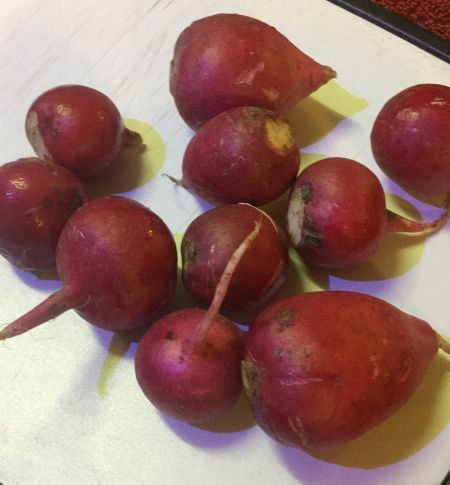 Then fill up your kitchen sink part way or add cool water to a large bowl and add in 1/2 cup of vinegar and soak your radishes for about 10 minutes. 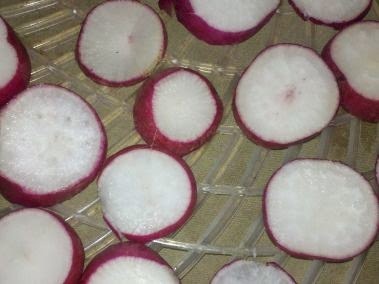 Next, using a knife or mandolin, slice your radishes into thin slices. Take the slices and lay them on your dehydrator trays. Now turn on your dehydrator and let the radishes dry. It takes about 6 hours for them to dry out completely or you can just leave them on overnight. 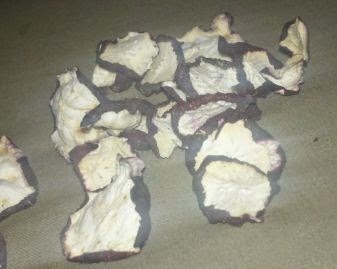 It doesn't hurt anything and I generally turn on my dehydrator right before I go to bed and turn it off in the morning. Once dry, store in a sealed mason jar. Radishes are great and have many health benefits. We like to use them in the winter time for when someone is congested. They really help. Dehydrated radishes can be eaten straight out of the jar or you can sprinkle them onto salads; add onto a sandwich; or even sprinkle them onto a taco. They add a zesty little crunch. If you want to reconstitute them, just add them to some cool water and let set for an hour or you can drop them into some really hot water for about 5 minutes. Or you can grind them into a vegetable powder or throw them into a soup pot. We also dehydrate Banana Peppers & Turnips. As crazy as it may sound, it is possible to dehydrate watermelon If you like watermelon, you should LOVE dehydrated watermelon. It is so much sweeter. The flavor is condensed and it is almost like eating watermelon candy. Or if you like salt on your watermelon, salt the watermelon on the dehydrator and give your tongue a taste explosion of salty & sweet! 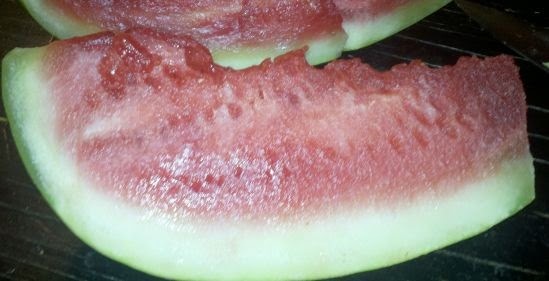 To dehydrate watermelon, just cut your watermelon into bite sized chunk. Or slice it into jerky like strips. We did some both ways today. The thin slices are the ones we prefer. 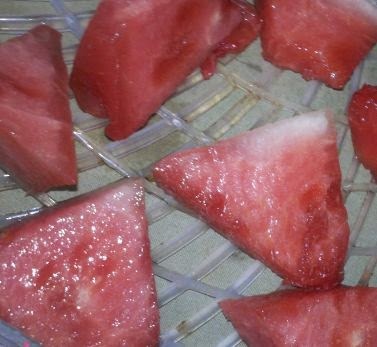 If you want salted watermelon, just sprinkle salt on the watermelon or leave them alone. It is delicious either way. Place the pieces on the tray and turn the dehydrator on. This is a long process but it is well worth it. A good idea is to rotate the trays around (bottom tray to the top, etc.) during the drying times. You know it is done when pieces no longer stick to the trays. Store in a mason jar on your shelf and enjoy watermelon all year long. We also dehydrate Pineapple & Kiwi.